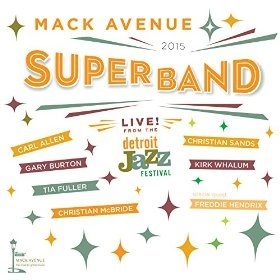 The Mack Avenue was formed specifically to appear at the 2012 Detroit Jazz Festival which was recorded and released on Mack Avenue MAC1076, three years later it appeared again and this recording is the result. There have been a number of changes in the bands personnel, firstly the bassist Christian McBride has taken over as Musical Director to replace bassist Rodney Whitaker, Carl Allen continues as the drummer and Tia Fuller still occupies the alto and soprano chair. Gary Burton continues on vibes and appears to be relishing a return to a more structured approach to the music. The band continues with the same musical policy using original material written by members of the group in a modern but straight ahead manner. True to it’s title Kurt Whalum’s “Preach Hank” gets the album off to a preaching start with all the band getting the chance to say their piece on a tune dedicated to Hank Crawford. This is just the type of number to get the band off to a cracking start. “Test Of Time” is the only track which has not been composed by a member of the group, it is in fact written by the Japanese pianist Makoto Ozone a long time associate of Gary Burton. It is a slow blues featuring Kirk Whalum’s passionate tenor and an equally inspired piano solo by Christian Sands. Gary Burton’s contribution to the concert was the ballad “All You Have To Be Is You” which features the wailing soprano of Tia Fuller with sympathetic backing by Gary Burton’s vibes. The final track on the album is pianist Christian Sand’s composition” Up” which lasts over eleven and a half minutes which allows the members of the band to solo including drummer Carl Allen and the Musical Director Christian McBride. This is an interesting band who play fairly straight ahead jazz but can assimilate all styles into it’s line up and produces some exciting music.